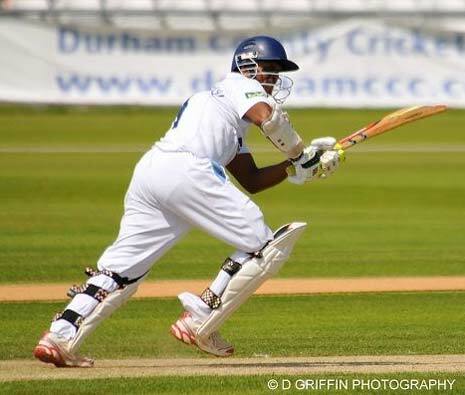 Derbyshire suffered another chastening day in their LV=County Championship match against Durham at Chester-Le-Street despite half-centuries for Shivnarine Chanderpaul (pictured below) and Tom Poynton. Set a monumental target of 472 for victory, Wayne Madsen's men reached 181-7 by close of play. Durham had earlier begun the second day on 208-2 with Keaton Jennings unbeaten on 65 and the Derbyshire attack had reason to be satisfied with their pre-lunch work, collecting five wickets for only 98 runs with the dismissals shared between Jonathan Clare, David Wainwright and Dan Redfern. Jennings reached his maiden championship century before he was 8th man out for 123. Durham declared soon after the lunch interval when Callum Thorp was trapped lbw by Redfern who collected career-best bowling figures of 3 for 33. The Derbyshire run-chase got off to a horrific start as the first five wickets went down with just 49 on the board. Ben Stokes struck twice early on, but it was Chris Rushworth - fresh from his six wicket haul in the first innings - that did most of the damage. The burly swing bowler took three more wickets to give him match figures of 9-97, a career best haul. Chanderpaul (76) and Poynton (56 not out) provided a semblance of respectability and - with Clare two not out overnight - the visitors require an unlikely 291 more runs for victory on the final day.